Tired of wearing your bangs the same ‘ol way day after day? Psh, don’t be such a bore! As it turns out, there are a ton of chic options for mixing up your style, and we’ve got the lowdown. Whether you’re seeking a brand new ‘do or simply want to add a pop of color to your fringe, heed these expert tips for hair that really shines. The overly blunt bang is a precision look that Rooney Mara really knows how to rock well notes stylist to the stars Julia Papworth. “It works best on medium to thick tresses.” If you already have the cut, simply blow dry your bangs with a drop of Redken Glass Smoothing Serum and use a comb while drying to eliminate volume. Finish off with some Enjoy Super Hold Hairspray to keep your style in place. Voila, you’re all done! One new fun trend in bangs is highlighting them a different shade than the rest of your mane, informs Edwards. “For example, if you have a bob that is dark brown, coloring chunky pieces of bangs with red or burgundy hues can give you a more stylish look.” Another fab fad to try is dyeing your entire bang a completely different color than your hair. Go big or go home, right!? According to celebrity hairstylist David Babaii, a heavy bang compliments most face shapes and provides a fresh, young look that women of all ages can experiment with. We love this ‘do on A-listers such as Christina Ricci and Zooey Deschanel. It’s just too cute! Unleash your inner rocker a la Rihanna and cut a super short, choppy bang that’s as unique as it is edgy. Edwards suggests overlaying longer pieces in between shorter ones. “This look is great because you have the versatility to spike up your bangs or wear them down,” he says. For this kind of styling, try Texture Defining String, which can be found here. You’ve seen ‘em on stars like Reese Witherspoon and Rashida Jones. And, as Papworth points out, piecey bangs are a much more wearable and versatile style than blunt bangs. To style them, add a little Kevin Murphy Anti-Gravity Volumizer, then blow dry back and forth with a brush to get some movement. For extra definition, use Unite Wicked Wax Finishing Pomade. Not ready to commit to a full-on fringe or are you in that awkward growing out stage? Then long sweeping bangs are definitely for you. The bang should sweep to one side, down by the bridge of your nose. For a more interesting look, Edwards advises snipping them at a sharp angle, either to the left or right, depending on where your part is. Perfect for a special occasion, get creative and wear your bangs in a 50s pompadour style, proposes celeb hair guru Nelson Vercher. “Pull your hair back in a high ponytail, then run sculpting gel through your fringe and comb into a pompadour ‘do.” It’s easy-peasy and oh so glam! 2. If your bangs begin to curl in an unwanted fashion, carry a mini flat iron around with you so that you’re prepared to straighten them, says Edwards. 4. Last but not least, always, always, always remember to pull back your bangs when you hit the gym. And, adds David, they should be blown out immediately after washing to make sure they fall properly. Are you bang crazy yet? 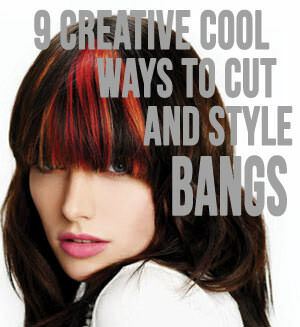 If so, you’ll love these 12 trendy ideas for long hair with bangs.